Like most companies, Trivera Interactive has embraced the holiday spirit – adorning our office with festive decorations, twinkling lights and even a handcrafted Mountain Dew tree. 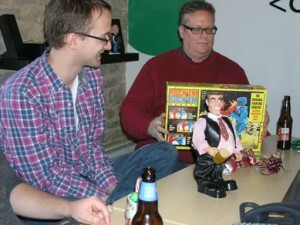 For our gift exchange this year, we decided to tackle the White Elephant in the room. 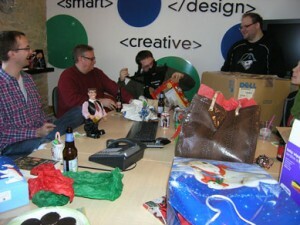 Many of our employees had not previously participated in a White Elephant gift exchange which made this event even more entertaining. We followed the conventional rules of drawing numbers and allowing people to choose whether to open a new gift or steal one from a co-worker. 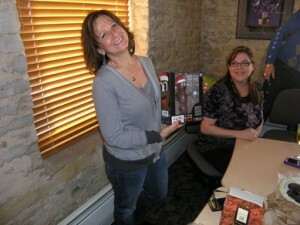 The first gift stolen was an antique-looking key which doubled as a bottle opener and tripled as a wine corkscrew. Fantastic! 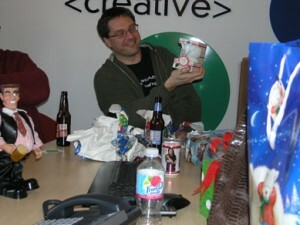 Another popular gift was a singing, dancing, pudgy man holding a beer mug. Everyone ended up with gifts to cherish. You cannot put a value on used firefighter boots and a book about surviving the Zombie Apocalypse. You just can’t. And, one co-worker got the last laugh as I opened the final, unwanted gift, after all of my gifts were stolen. Yes, Kenny G.’s “Duotones" CD is the gift which keeps on giving. I was pleasantly surprised to discover the Best Buy gift card Tom had cleverly tucked inside the CD, however. So, all’s well that ends well. Our team had a lot of fun, countless laughs and we’ll be inviting the White Elephant back to our room next year.